The history of the Petawawa Public Library can be traced back to 1973 when what is now known as the Town of Petawawa consisted of two separate municipalities: the Village of Petawawa and the Township of Petawawa. At that time, the two communities agreed to form a Union Library Board which would serve the needs of their combined populations. 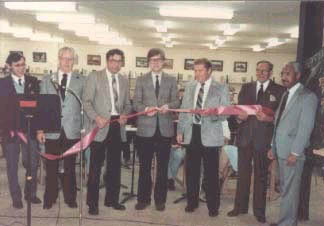 When the “Petawawa Village and Township Union Library” officially opened to the public on May 12, 1975 at the Petawawa Civic Centre, it contained approximately 3500 books within a 1900 square foot room. It was open to the public every Monday, Wednesday, and Friday from 6:30 to 8:30 p.m. and many of the staff worked on a volunteer basis. By 1980, as membership increased to 4000 and the book collection began to outgrow the existing space, the Library Board, under the leadership of the Chairman, Dr. R. Robinson decided to explore options for library expansion. In August 1982, the library took up temporary residence upstairs in the Civic Centre in order to provide uninterrupted service while construction of the library extension took place. The grand opening of the renovated and expanded Petawawa Village and Township Union Library took place on Wednesday December 29, 1982. In his address to the audience gathered for the opening ceremony, Dr. Robinson described the library as “a cultural and interest centre for all ages” and “a place for intellectual growth”. 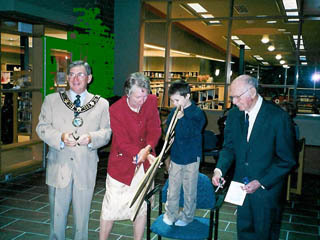 In 1997, with the amalgamation of the Township and Village, the new Town of Petawawa became home to the “Petawawa Public Library”. Left to right: Mayor Bob Sweet, Library Board Chairperson Lynne Sawford, patron Dylan, Joe Classey; past Library Board member, and volunteer. As the collection and membership continued to increase, more services were added, including Public Internet access. Discussions about further expansion took place and plans were made to once again temporarily relocate the library to allow for renovation and new construction. On October 1, 2003 the library closed its doors at the Civic Centre and moved to its temporary home at the old Pharma Plus building on Victoria Street where approximately half the library’s holdings were available to the public. The rest was placed in storage for the duration of the renovation. Construction at the old site began in late October, and throughout the winter and spring many new and exciting changes were made. Less than one year later, on August 2, 2004 the temporary location of the Petawawa Public Library closed, and the move back to the “new” library began. The official opening ceremony was held for dignitaries and donors on September 24, 2004. On October 4, 2004 the Petawawa Public Library re-opened to the public. More Public Internet Stations were made available and Wireless Internet capability was added to the services provided in the larger 12,000 square foot facility. The building was debt free upon completion due to the Town’s foresight in setting aside monies for the project and the efforts of the Fundraising Committee. Donations from the Rotary Club and other local businesses and individuals allowed for the inclusion of a multi-purpose meeting room, now known as the Rotary Room. Today, the Petawawa Public Library continues to grow. It employs full-time and part-time staff and continues to rely on the help of loyal volunteers to serve over 7000 active members. The collection still provides access to books, movies, music and Public Internet stations for all ages. We are also a WiFi hotspot and provide access to downloadable eBooks and Audiobooks. The library catalogue is available online and a variety of electronic research and hobby databases may also be accessed by members inside and outside the library. We provide programs for all ages: Children, Teens and Adults. We have undertaken a project to digitize our Heritage Collection consisting of photos, documents and audio recordings which are freely accessible online. The library supports the Town Recreation Department’s focus on intensifying physical activity, community development and environmental stewardship by providing access to snowshoes, nordic walking poles, gps units and binoculars to members and visitors to the area. In addition, the first Book Tree in Renfrew County is located in the playground just across from the library. The library was one of the key partners in bringing the program to Petawawa. The library is open 6 days a week but 24/7 access is available for most online resources. It’s your library: Check it out!